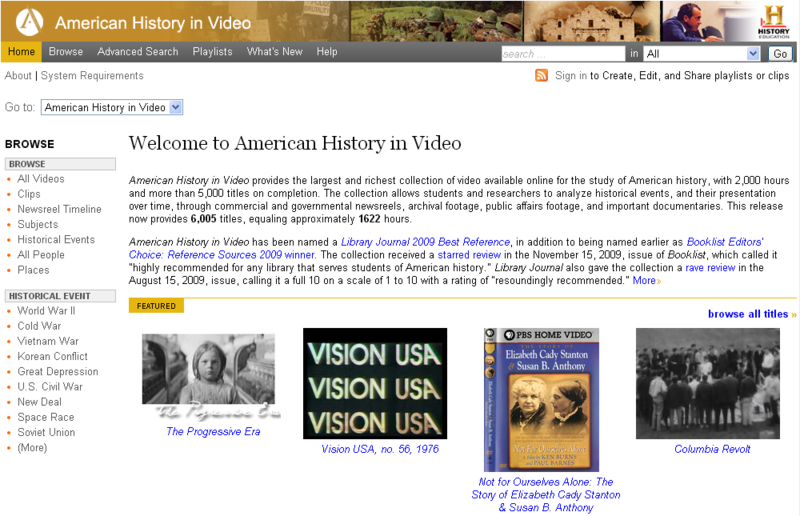 American History in Video is a collection of videos available online for the study of American history. The collection allows students and researchers to analyze historical events, and their presentation over time, through commercial and governmental newsreels, archival footage, public affairs footage, and important documentaries. About the Playlists feature in the system: these are themed collections of materials created by individual users. They can contain whole videos, tracks, segments (clips), and other items (such as links to any URL). They can be annotated, edited, copied, and shared, and each playlist contains its own unique, stable URL. Nice for students doing assignments; equally nice for teachers to get students to present results of research.